"The violent, dark stories in this anthology fit the bill perfectly with the intention, as editor Hennessy writes, to be social commentary. With a map to illustrate the location of each selection, the collection points to the setting of each disturbing story or crime. Tales by Jane Hamilton and Christi Clancy stand out, evidence that ordinary people can get swept up in hatred, even if they did not start out living with violence, drunkenness, or poverty." "Milwaukee bookseller and writer Hennessy does justice to the harsher aspects of his hometown in this fine anthology...The 14 contributors show that violence is not a prerequisite to crafting a haunting depiction of despair...The selections make the different neighborhoods, seedy or otherwise, come to life, even for those who have never set foot in them." "Fourteen free-wheeling stories document the grit and glory of Milwaukee...A nod to Milwaukee's blue-collar heritage, a frank look at racial disharmony, and a peek at the future make Hennessy's collection a find for fans of urban noir." "Akashic's distinctive series of crime fiction anthologies arrives in Brewtown. The fourteen contributors include familiar Wisconsin writers Valerie Laken, Jennifer Morales, Jane Hamilton, Larry Watson, Nick Petrie and my Journal Sentinel colleague James E. Causey. 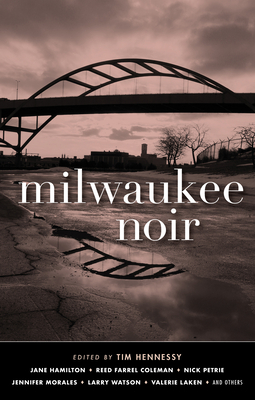 Like other volumes in this series, Milwaukee Noir foregrounds specific locations: for example, Watson's story has a Yankee Hill setting, and Morales' is set in the Silver City neighborhood." Brand-new stories from: Jane Hamilton, Reed Farrel Coleman, Valerie Laken, Matthew J. Prigge, Shauna Singh Baldwin, Vida Cross, Larry Watson, Frank Wheeler Jr., Derrick Harriell, Christi Clancy, James E. Causey, Mary Thorson, Nick Petrie, and Jennifer Morales. The book you're holding is the first of its kind--a short fiction collection about Milwaukee, by writers who've experienced life here. The crime/noir genre at its best can be one of the purest forms of social commentary. I've gathered contributors who can tell not just a fine story, but who can write about the struggles and resilience of the people who live here...I'm honored to compile a body of work that represents what I love, and fear, about Milwaukee. I love my city's lack of pretension; its stubbornness and pride in the unpolished corners. I fear that my city faces an uncertain future--that as it becomes more divided it may pushes our best and brightest to find somewhere else to shine. Tim Hennessy is a bookseller and writer who lives in Milwaukee with his wife and son. His work has appeared in Midwestern Gothic, Tough, Crimespree Magazine, and the Milwaukee Journal Sentinel, among other places.